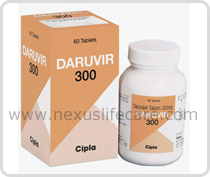 Uses:- Daruvir Tablets is an antiviral agent, prescribed for HIV infection with other antiviral agents. It is a protease inhibitor and blocks the enzyme activity. Daruvir Tablets slows down the spread of virus in the body.